Supports the theory that that OVDP is nothing but an #FBAR Fundraiser for those who didn’t even know they had Offshore accounts. 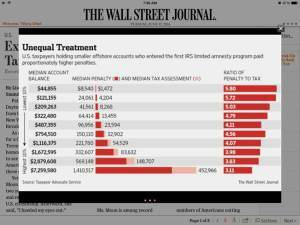 Unequal treatment: Apparently, U.S. taxpayers holding smaller offshore accounts who entered the first IRS limited amnesty program paid proportionately higher penalties. This entry was posted in Uncategorized on August 3, 2014 by renounceuscitizenship.